Remembering the Great War Database – a spreadsheet created by the staff of the Waterloo Region Record documenting Waterloo County soldiers in World War I. Soldiers of the First World War – Canadian Expeditionary Force – Search the Library and Archives Canada database of soldiers of the Canadian Expeditionary Force. Please be aware that Library and Archives Canada is undertaking a digitization project involving records from this collection. Digitized service files are available for early alphabet surnames. If a service file is not yet digitized, the most that you will find is the digitized attestation paper, which can still be helpful in learning more about a soldier. Canadian Great War Project An ongoing project to document all Canadian service people of the First World War. Be sure to check out the new search functionality here, developed by the University of Victoria. Maple Leaf Project – A project in remembrance of Canada’s war dead. Veterans’ Death Cards – First World War A digitized collection of cards registering details of veterans who died after the First World War on the Library and Archives Canada website. Circumstances of Death Records – First World War – a digitized collection of records related to the deaths of service people in the First and Second World Wars on the Library & Archives Canada website. Records detail burial requests, sites and grave site information. Search the digitized microform/volume numbers here. Royal Canadian Legion – Legion Magazine – Last Post database – a searchable database of deceased Canadian veterans (predominantly WWII). List of Officers and Men of the 118th Battalion, 17 June 1916 (including service numbers) from the 17 June 1916 edition of the Berlin Telegraph. War Archives – Waterloo Region during the First World War – a website documenting life, events and themes surrounding the Great War in Waterloo County. Includes newspaper clippings and other resources. Currently pre-1914 and 1914 are they only years covered. This is an ongoing project undertaken by University of Waterloo history students. Blog post about Desertion in the 118th Battalion from the Laurier Centre for Military Strategic and Disarmament Studies and desertion correspondence from the Lt. Col. W. Lochead Fonds. Regimental Rogue provides a comprehensive guide on how to research First World War Canadian soldiers. Lest We Forget: First World War Cenotaph Research – Information Package – A guide to researching WWI Canadian soldiers and how to read service records. Military Abbreviations Used in Service Files – Library and Archives Canada – a helpful list of military abbreviations used in Canadian Expeditionary Force service files. Oral Histories of the First World War These first-hand accounts, which can be listened to or read via the retyped transcripts, provide the personal insights on the experience of war by one of the greatest generations that Canada has ever produced. Courts-Martial of the First World War Search for military tribunals involving Canadian soldiers. WWI Aces of Canada Learn more about Canada’s First World War flying aces and aircraft at the Aerodrome website. Veterans Affairs Canada – Remembrance – Main page for world wars and remembrance – Check out information under History – First World War and Memorials. Waterloo Region Generations This database is a growing collection of individuals who lived in Waterloo Region (formerly County). Search by surname for soldiers, and their families. Cambridge City Archives – Search the online archives database of the Cambridge City Archives for information about soldiers, local events and other items of interest. 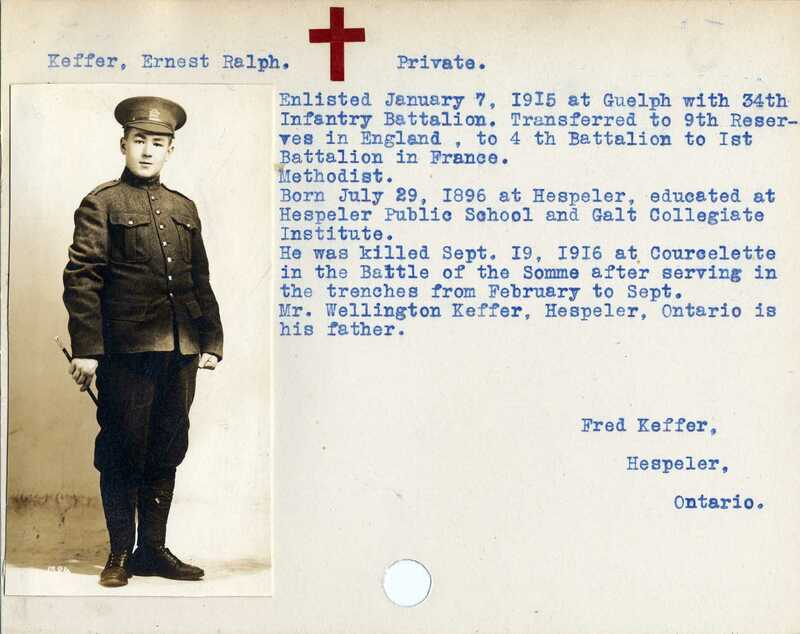 Canadian Great War Project – Hespeler Men – a list of Hespeler men who served in WWI – may be helpful to those searching for soldiers who came from the Coombes Home in Hespeler, Ontario. British Home Children in Canada – compiled by Lori Oschefski. A searchable database of British Home Children, who arrived in Canada from 1869-1939. Ontario Cemetery Finding Aid If a soldier was buried in Waterloo or Wellington counties, you can locate their place of burial with this database. Please note that only Ontario burials are in this database and not all area of Ontario are covered. However, Waterloo and Wellington Counties are very comprehensive and complete. Headstone transcriptions for Waterloo and Wellington Counties and other select surrounding counties/townships are available in the GSR – you can search KPL catalogue here. Call InfoLink (519-743-7502) during library hours or email Information Services for a lookup. Canada GenWeb’s Cemetery Project – also includes headstone images for some cemeteries. Select cemeteries by province and then search by surname. Commonwealth War Graves Commission – The Commonwealth War Graves Commission is entrusted with the stewardship of the grave sites of the 1.7 million service men and women from the Commonwealth who died in both world wars. Northern Ontario Canada Gravemarker Gallery – Northern Ontario cemetery headstones – good coverage of Sudbury area noted. In Memory– a site dedicated to listing and photographing lesser known war cemeteries and graves in France and Belgium. Our Digital World (formerly Our Ontario) has an index of digitized Ontario newspapers available to search. Some are full text. Please note that there are no Waterloo County/Region newspapers included in this collection. Red Cross Prisoners of the First World War database. This database, maintained by the International Committee of the Red Cross (ICRC), contains records of over 5 million civilians and servicemen detained by military forces during World War One.